How do you get to Add/Remove Programs in Windows? It’s a question that most of us can’t answer. 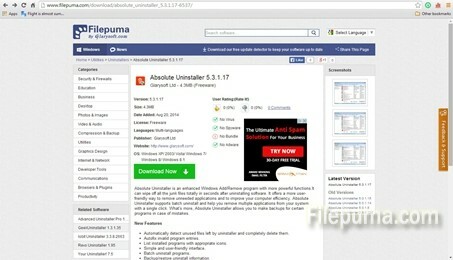 You can Google search it or you can solve the problem with Absolute Uninstaller by Glarysoft in just a few steps. 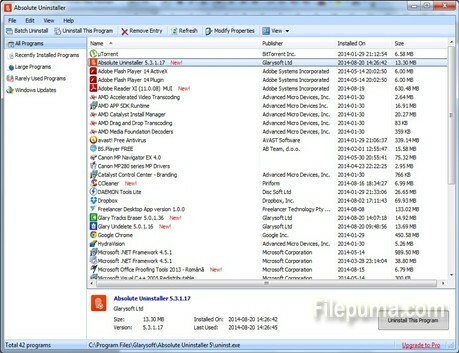 Step one: First you need to download the free software from Filepuma.com by clicking on the green “Download Now” button. Step Two: After you start the program you will see that the program list on the right side of the window is already populated with all the software you have installed on your computer. I would note that it searched for the applications faster than the add/remove programs in Windows. It will display all the programs although on the left you have the options of selecting only the recently installed, the large, the rarely used or just the Windows Update ones. You can narrow your search that way. Step Three: An interesting feature that you don’t have with the Windows feature is the Batch Uninstall, highlighted by the red arrow on the picture below. If you check it, you will be able to check several programs to uninstall in the same time. 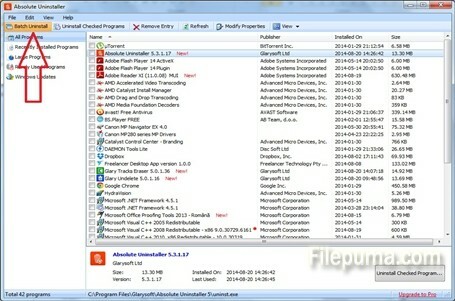 Absolute Uninstaller is just the quicker software for uninstalling programs.